GHRC presented members of La Puya with a book of messages of solidarity at the movement’s third anniversary event. “This is one of the most important human rights issues of our time,” stated Inter-American Commission on Human Rights (IACHR) President Rose-Marie Belle Antoine, referring to the wide-ranging effects of extractive industries on communities in Latin America. Last week, the IACHR held a hearing on this topic as part of its 154th session. During the hearing, members of the Catholic Church presented emblematic cases of human rights violations resulting from extractive projects in the region. They also detailed the criminalization of land rights defenders, and raised concerns about the serious damage being done to the environment as well as to indigenous communities. “We can live without gold, but not without water,” said Álvaro Leonel Ramazzini, a bishop of the Catholic Church in Guatemala and a petitioner at the hearing. Bishop Ramazzini also noted the importance of prior consultation and called for other sustainable models of development that will not undercut the local economy. At a public event later in the week, leaders from Latin America also came together to discuss new opportunities and challenges for engaging on extractive industries in the region. Participating as a panelist at the event, Francisco Rocael Mateo – a member of Guatemala’s Western Peoples’ Council of Mayan Organizations – spoke about the overwhelming rejection of mega-development projects by many communities across Guatemala. While this important topic is raising increasing concern in the international community, the governments of Guatemala, Honduras and El Salvador have proposed an initiative called the “Alliance for Prosperity” – a plan that promotes the very projects that have had such detrimental impacts in the region. GHRC staff members in DC have been busy working, in conjunction with our Guatemalan and DC-based partners, to provide information about human rights abuses resulting from large-scale extractive projects. This is especially important as the US government considers providing funding for the Alliance for Prosperity. We also participated in a series of meetings to advocate for the Guatemalan government to implement a reparations plan, which was signed in November of last year, for communities affected by the Chixoy dam. 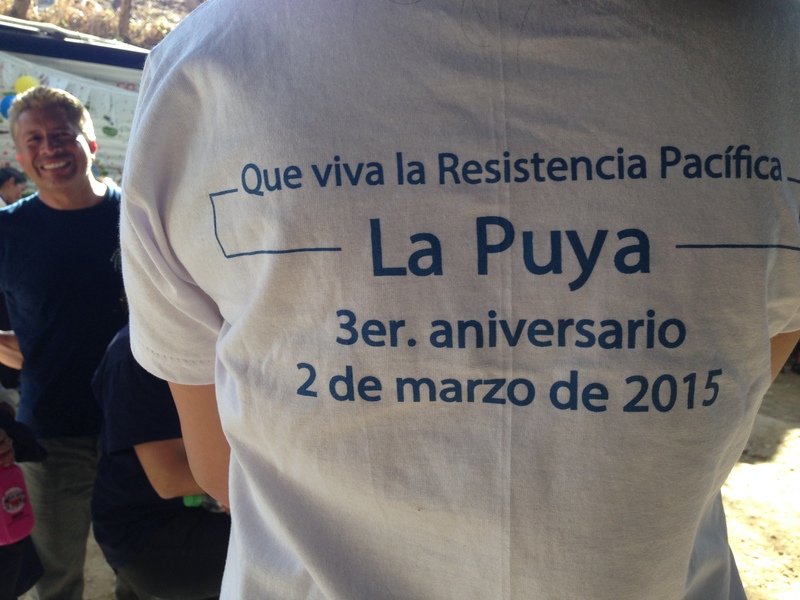 On March 2, environmental movement “La Puya” celebrated its third anniversary of peaceful resistance to the El Tambor gold mine. At the celebration event, GHRC staff presented a book of over 200 messages of solidarity from our supporters. More information and photos from the event are available here. GHRC also accompanied a group of community leaders from La Puya who faced trumped-up criminal charges as a result of their participation in the resistance movement. As of February 27, all five leaders have been declared not guilty of the crimes of kidnapping, coercion and threats against three employees from the El Tambor mine. GHRC is also monitoring an ongoing conflict in Barillas in which three community leaders who had been active in a resistance movement against the Qanbalam dam were arrested without evidence. Just yesterday, another land rights defender, Rigoberto Juárez Mateo, was arbitrarily detained in Guatemala City. Our partner UDEFEGUA found that in 2014, 82% of attacks against human rights defenders were perpetrated against those defending land and environmental rights – making international awareness and solidarity more crucial than ever. This entry was posted in Human Rights Analysis, Land Rights and tagged Barillas, Chixoy Dam, El Tambor, IACHR, La Puya by ghrcusa. Bookmark the permalink. Can you share more information on who and what was presented at the hearing?